California native trying to navigate her new life in NYC as a recent transplant, post-grad, who tries to make friends, explore the city and eat well on a small budget. She’s known for her fairly obscure pop culture references and gumption. You can see some of that doogen.wordpress.com or her twitter @doogencreates. Whenever I go get Indian food, I always treat myself to a Mango Lassi. And thanks to this Desserts for Breakfast recipe, I can have a Mango Lassi any time I want. That my friends, makes me real happy. Happy happy mango lassie. 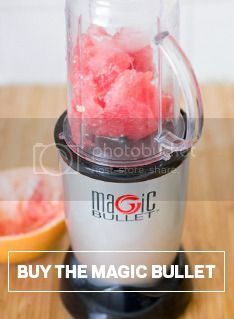 Peel your mango, chop it up into large chunks and put all your ingredients into the Magic Bullet. I had to do this in two parts so that it wouldn’t be too full. Blend! Once everything is well mixed, you can pour it into your popsicle molds. I improvised with small plastic cups and poured the mixture in and let it freeze for about an hour and then stuck my popsicle sticks in the middle. Let them freeze solid around 4 hours or overnight. Then, when you have a craving for something fruity and delicious and slightly exotic, run your popsicle mold under some warm water, pop it out and thank yourself for trying out this recipe!